In the aftermath of the brilliantly managed defence of Suakin, the reputation of our Gentlemen soars both on the British press, in The Sultan’s Court and Khedive’s administration. Pasha Drydon-Spunck is immediately ordered to Cairo, while Warburton is promoted to Colonel (with a field promotion to Brigadier) with orders to reorganise the Egyptian forces in Suakin. At the request of The Khedive, Smith-Dorian is temporarily seconded to The command of Brigadier Warburton. Again, the Gentlemen are showered with presents from a grateful Ottoman Empire. However, at this point a dangerous, indeed poisonous seed starts to grow in the mind of The Khedive. While everywhere else on The Sudan, his forces are being routed, here at least is a command that consistently wins against the enemy. Perhaps they are the key to destroying The Mahdi? Behind the scenes and throughout February telegrams are exchanged between London, Cairo and Baghdad. 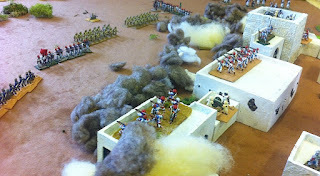 The British ae anxious not to embroil their forces in the interior of The Sudan any more than necessary. The Ottomans quickly conceive of a blow to the centre of The Mahdist control of northern Sudan via Ariab to Berber. The British caution against this, and refuse to commit British forces to such an adventure. But this only seems to harden The Ottoman position and a desire to unleash their imagined-powerful forces at Suakin. They are completely unaware of how close our Gentlemen have come to disaster on several occasions; something our Gentlemen are completely aware of. On then 25th February the fateful telegram arrives. Orders to take Ariab as a precursor to seizing Berber back! Energetic work is now undertaken to prepare the forces for departure. Over a G&T the Times correspondent, Michael Trevelyan informs the group that British public opinion is strongly supportive of seeing British troops intervening on the Sudan, but The Government is against this. However, on the day of departure a telegram arrives for Smith-Dorian. Indeed British troops will accompany the expedition. Reinforced by British regulars, the party plan their march to Ariab. Diary Entries of Captain Simon Heronimus Bladdington for 26th February 1883"
Weeks pass peacefully after the battle of Suakin, civilians have calmed down and trade has restarted in the port. The region has become more peaceful and patrols have not met any resistance thus far. Things of Note: Col. Drydon-Spunck been sent to Cairo to meet with some high officials. Captain Warburton has been promoted to Colonel. Captain Hacker is still off on his grand tour of Egypt. Captain Smith-Dorian has been seconded with his navy fellows to the defences of Suakin until further orders. A week or so later. New orders have arrive that a force commanded by Col. Warburton will set forth to liberate the lost town of Ariab due west of Suakin, and on the road to Berber. A plan of march was drawn up to take into account the amount of supply’s needed for such a long march of about 140 miles. It was decided to take 400 water wagons consisting of about half the water that we would need and to scout out for watering holes to refill the remaining requirements on the way. The scouting would be taken in turns by the 8 companies of Egyptian mounted infantry. The 9th Sundanese regiment would man the water wagons replacing the wagoneers and thereby reducing by about 400 mouths the water and food we would need to transport. This gave a great boost to our moral!!! It took 12 day to march to Ariab with no enemy spotted. Our Scouts found the water needed for the trip and supplies were good and moral high although the Egyptian infantry where a little low, Col. Warburton managed to do himself some harm after a bit of sport hunting some wildlife. He was thrown from his horse and with little much to add won’t be walking upright for a few weeks said the Surgeon Renolds (a mighty swelling in the testicular region apparently). So it was left Captain Dorian and my self to lay the plans for the attack on Ariab. Our scouts didn’t manage to scout behind the town as enemy patrols where too numerous. From the high ground we did control it looked like an oasis to the left and more trees and hills to the right. We would split the force into 3 sections and decided for a frontal attack on the town as we didn’t want to get our troops bogged down with surprises in the hills. We would bombard the town for 10min at the crack of dawn with our 4 cannons sections plus 1 machine gun section if it could get close enough on the right flank. The far left would have our camp guarded by 3 Sudanese company s previously commanded by Captain Hacker and 4 companies of the navy plus 1 machine gun and the 2 British artillery pieces paid off to bombard the town. Our centre was hidden from enemy sight and would conceal the 8 companies of mounted Egyptians ready to advance and take them far enough forward to dismount and take up firing positions in front of the enemy’s walls, while the British troops marched behind supported by their machine gun. My position was to the right where I managed the Egyptian guns and machine gun fire at the far right tower that looked like it may have a cannon battery held within. 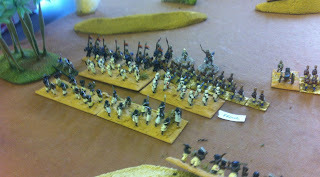 And I put my Sudanese troops out of sight to advance after the 10 min bombardment. 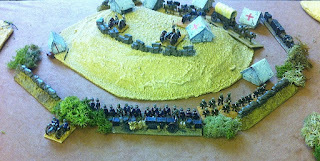 The lancers were kept back with the cannon as a mobile reserve and rear guard. The dust made by our bombardment made it impossible to guess if casualties were caused to the enemy for the exception of the tower on the right it exploded into rubble … guess our troops got a lucky hit on a magazine! Those officials back in Suakin may of heard the explosion! The advance started well, my Sudanese advanced in good order with orders not to fire until they got within affective range and hoping the dust would keep them concealed from the enemy. I could see Captains Dorian's troops advancing in the centre, I reckon he would have the harder job today locking horns with the centre of the towns defenses. The guns to the right moved target to the walls but fired less often to preserve ammunition. The right hand machine gun advance with the troops. The Mahdists in the town where firing a few light guns back at us with no real affect as they where also blinded by the dust and smoke cased by the bombardment. There was only a light breeze that barely moved the smoke and dust across the front of the town. 25min had gone by when by God I realised I may have made a pivotal mistake while advancing on the town. Myself and 8 companiess (plus machine gun) had strayed to far to the right of the town and had strayed too close to the tree line. I ordered 2 companies to halt and cover the tree line while the rest advanced. I could here Captain Dorian’s rifles to the left firing … guess they could see more through the dust than my troops. And darn it happened again like honey to a bee them Mahdists appeared at the tree line and on the hill at about 600yard with more behind “I thought back to Toker and how quickly the Mahdists had covered 400 yard and up a wall in such a short time”. I ordered my troops to halt and form line with the machine gun for the forthcoming charge. I also sent my messenger to send the lancers in to support and with orders for the cannons to change target. The enemy advanced in the open but the 8 companies of Sudanese and the machine gun did little to stop their advance. The cannon must of acted on their own initiative … good lads, I owe ‘em a drink when this is all over … Their timely fire slowed the enemy for enough time to allow the lancers to counter charge the enemy that had engaged the 10th Sudanese. The lancers drove ‘em back then the next group of Dervishes were upon us, the fighting intensified and 1 company of lancers and Sudanese 10th where lost … the cannons must of hit a Mahdist Emir on the hill as the enemy lost momentum for a moment allowing another well aimed volley before they where back into melee with their 4th wave of warriors. Yet we drove ‘em back and the Sudanese and lancers did it again!!! Pushing the enemy back again! one of the 11th Sudanese and another company form the lancers fell but their job had been done well. My messenger reported that the 9th Sudanese had fallen back from the fighting so I took my horse a rode to rally them leaving orders for the 10th, 11th and the lancers to reorganise and continue the advance now that the right flank was clear. 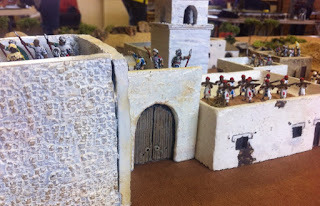 I managed to rally the 9th Sundanese and start leading them back in to the fighting, I could see that Dorian’s British and Egyptians had almost made it to the walls of the town and the wall were stained with the defenders blood. The guns, machine guns and rifle frie had done great execution that day. There was a lot of dust off to his left and it looked as if one regiment of Egyptians where holding of a flanking force. 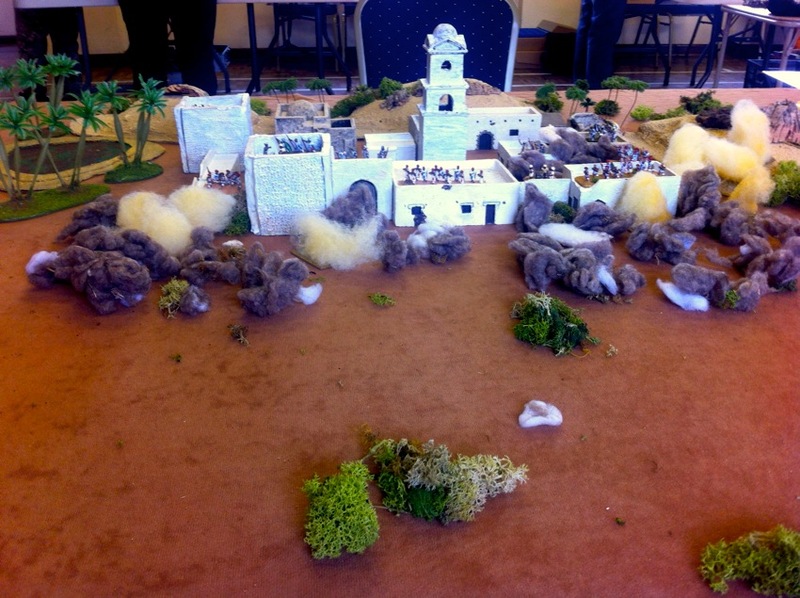 The battle ended within the next 30 mins as the British and Egyptians broke over the sparsely defended walls to the front and the 10th and 11th Sudanese went through the right of the town through the ruins of the tower. 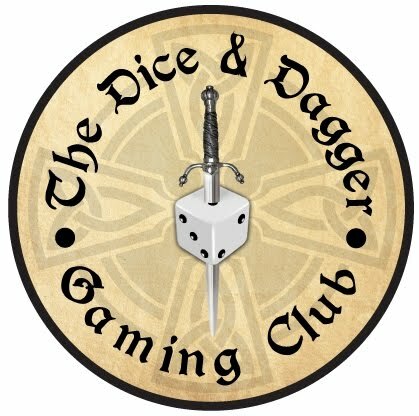 The battle was over and the Mahdists fled. The town was made safe but it was dusk and before all the troops came into the town with the baggage. Good quantities of food and ammunitions.